The bottom line of the Brussels euro-zone summit agreement in July is a stitch-up which consists of culling public services, national democracy and independence. The transfers of huge sums of monies involved are to prop up the banks once again – especially those of Germany and France – and will not get Greece, Ireland, Portugal or Italy out of the financial quagmire. These economies will be made worse and prevented from getting out of the red for many years ahead. Further, money will be transferred out of pockets, purses and pay packets into bank vaults, even though it is apparently laundered via national government books, loans, bonds and other puzzling fiscal devices. The people paying did not bring about the crisis. One of the 16 clauses of the agreement states the strict rule of the EU Stability and Growth Pact which should limit the annual budget deficit to 3% of GDP and this must be re-applied. The rule has proved to be largely impractical even for Germany and France, but is designed to provide a motive for further attacks in the form of common EU austerity policies on wages, the public sector and social protection across all EU Member States including Britain. Another aspect of the 16 clause euro-zone agreement is to push further towards an economic union in addition to a monetary union. All controls would then be taken away from national governments, parliaments and electorates over their economies. With a fiscal union each euro-zone Member State would lose further sovereign controls in addition to those already given up over interest and exchange rates. This has in effect happened already to Greece, Ireland and Portugal with Spain, Italy and now Cyprus queued to tumble into the crisis. 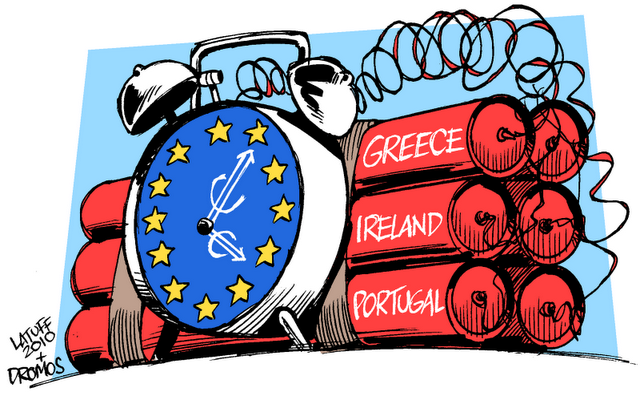 European Central Bank (ECB) and IMF officials are now telling the governments of Greece, Ireland and Portugal how to apply the draconian austerity policies and ensure they are put in place to pay back the high interest ‘loans’. In other words these officials are strutting around capital cities taking away the right of a nation-state to self-determination and control of its own affairs. More importantly the 16 clauses, EU Stability and Growth Pact and the EU Constitution (Lisbon Treaty) only permits capitalism and blocks socialism. Those who want to achieve socialism appreciate that you have to have the power and right to make laws in a nation-state. The struggle for the latter objective is the class struggle for national independence and democracy. Whichever way the EU political elite try, whether to apply the Stability Pact rules and 16 clauses or not, the problems will persist and worsen. This will be especially so for the working and middle classes whilst the rich elite make even more money. It is clear that if further austerity policies are imposed there will be at some point a serious revolt. No doubt this is a factor behind the lower interest rates to be paid for by Greece on the second lump of money compared to the first lump. Already a growing resistance movement to the austerity policy is taking place in Greece and we call for and support solidarity with them. The obvious path that Greece, Ireland and Portugal must take is to leave the euro-zone so that they can retrieve the sovereign right to devalue their own currency and improve their exports. Such a course has to be decided by the government, parliament and electorate of each country involved without interference from the EU, Commission, ECB, IMF or anybody else. The lesson for us here in Britain is that it is just as well we did not join the euro-zone where it has been proved once again that 17 national economies and currencies cannot be yoked together. Chancellor Osborne has called for more EU integration and is telling other Member States what to do. This reflects a major change in ConDem government policy which favours a two tier EU. Meanwhile Germany and France want to take advantage of the eurocrisis to press for more integration inside the eurozone. The common sense move that Britain must take to get out of the suicidal euro-zone is to leave the EU superstate as soon as practical. "By the end of the summer Angela Merkel and I will be making joint proposals on economic government in the eurozone. We will give a clearer vision of the way we see the Eurozone evolving. Our ambition is to seize the Greek crisis to make a quantum leap in Eurozone government. The very words were once taboo. (Now) it has entered the European vocabulary. France has fought for a long time for an economic government of the euro zone. We can't keep having a currency disconnected from economic policy. We have done something historic ... There was no European Monetary Fund. We're not there yet, but we're progressing, and we have to continue towards that ... To arrive at this economic integration we have to work on convergence. Naturally, France and Germany, being the two biggest countries of the Eurozone, have to lead by example." "We have a shared currency but no real economic or political union. This must change. If we were to achieve this, therein lies the opportunity of the crisis ... And beyond the economic, after the shared currency, we will perhaps dare to take further steps, for example for a European army". "With Italy and Spain infected by the contagion that Ireland, Greece and Portugal were unable to recover from, completing the euro project by creating a fiscal union appears to be the only real alternative to preventing it joining failed monetary unions in the dustbin of history. The issuing of eurobonds has consequences far beyond finance and economics. For euro zone states to fund themselves with euro bonds would be a step towards full political union. But this has always been the project's ultimate end-point. And for good reason ... As long as integration is Europe's destiny, it is Ireland's destiny too." On 29 July Spanish Prime Minister Jose Rodriguez Zapatero called for an general election in November. This follows months of protests against another round of austerity measures and amid market worries that the country may be heading towards a Greek-style bailout. "The decision to announce the elections calendar today is to project political and economic certainty for the next few months: about what is needed to do, what we're going to do and about the date of elections," said Zapatero. George Osborne says the "remorseless logic" of monetary union takes the single currency members in the direction of greater fiscal union, even if that did not necessarily mean having a single European budget or a single EU finance minister. "I think we have to accept that greater eurozone integration is necessary to make the single currency work and that is very much in our national interest," he says. "We should be prepared to let that happen." Mr Osborne admits this flies in the face of traditional British policy, which has always suspected such a union as being the precursor of an elite group of EU members, which would ultimately dictate policy to those on the outside. The chancellor seems more relaxed about that possibility, but insists that key decisions must still be taken at the level of all 27 member states, not least on matters affecting the single market. Speculation continues to mount over divisions between David Cameron and Nick Clegg on EU reform, following David Cameron's calls for the UK to exploit the eurozone crisis to win concessions in financial services, employment law and the EU budget. Last week Nick Clegg said, "I don't think it helps at all, when we are looking forward at trying to work out what comes out of the discussions on the reform of the eurozone, to prioritise what we think we can kind of get out of it." It is clear that Germany and France are going to take advantage of the euro-crisis and use their powerful position in the 17 Member State eurozone to press ahead for further integration. This means a two tier EU. At the same time Britain's policy over the EU has changed and the Government is no longer attempting to be at the heart of the EU and has accepted the two tier objective. This has thrown up divisions within the ConDems. Because Ireland will remain in the eurozone and Britain outside, the border between the Irish Republic and Northern Ireland will be kept in place making the objective of a united Ireland more difficult.